Yes finally some knitting content. This bag was fun and easy to knit. 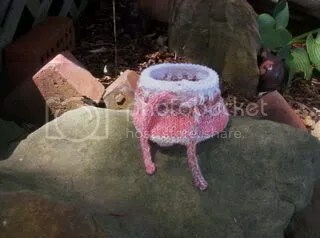 I made mine a little shorter than most of the others I seen knit up. I was going for a Native American look. It kind of reminds me of the clay pots you might see food or water carried in. The name of the actual pot escapes me at this moment. There is a contest going on for this bag so be sure to stop by NH Knitting Mama’s blog and check it out. You have until September 3rd to knit one of your own to be entered. And on a final note. I had no idea it would be so hard to give away something made by me for free. I have joinned in the Pay it Forward exchange going around see earlier post. I thought for sure 3 people would jump at the chance to recieve a free gift but so far only two people have taken me up on the offer. Who’d a thunk it. I can’t even give away one of my hand sewn bags.Yep you guessed it I’ve decided to make up 3 of my Ruby June hand bags and give them away as my Pay it Forward gifts.Well I guess it will only be 2 bags since I can’t get anyone else to take it off my hands.